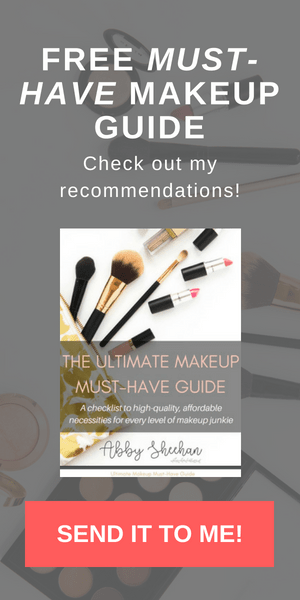 If you’ve read my recent “Current Beauty Favorites – Spring 2018” post – you will have seen me rave about the ways I have been loving coconut oil lately. I am so excited about my favorite oil, in fact, that I decided to dedicate an entire post to this natural miracle. If you’ve never used coconut oil before, let me introduce you to the amazingness! One of the best reasons to start incorporating coconut oil into your beauty routine is simply because of its all-natural benefits. Coconut oil does not contain many of the harsh chemicals, dyes, and toxins that many typical beauty products have on their ingredient list. 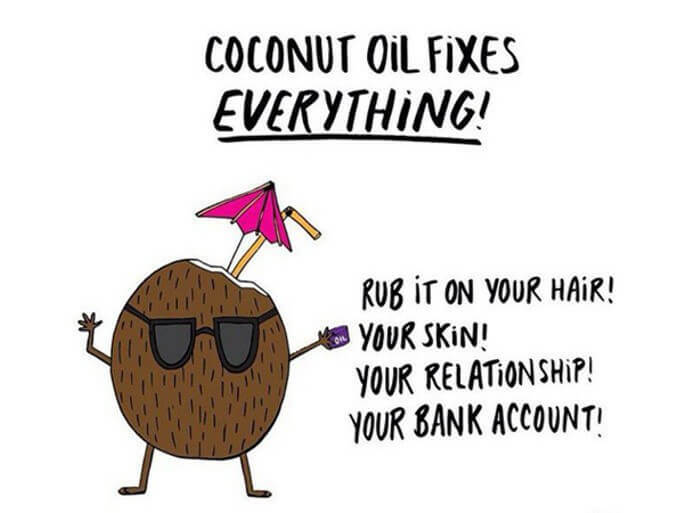 Coconut oil is 100% natural and a gift from mother nature herself! 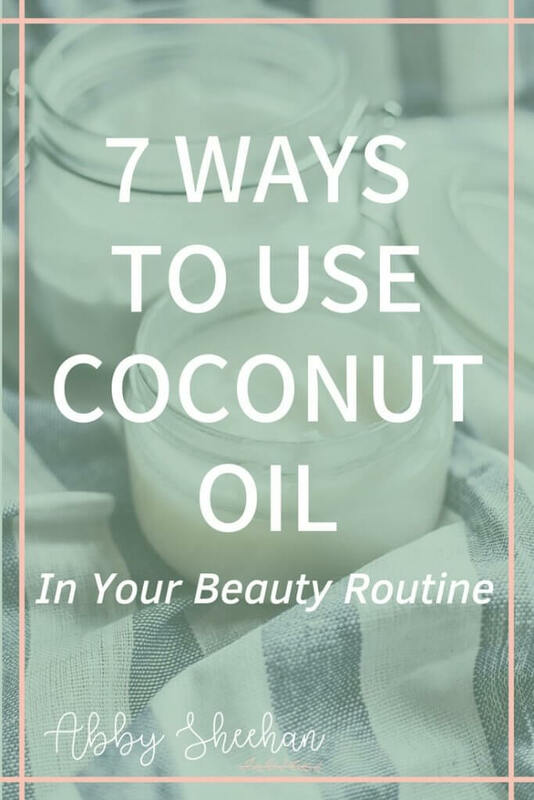 Let me introduce you to seven of my favorite ways to incorporate coconut oil into my beauty routine! My first use is probably the most obscure one. Ever heard of oil pulling? 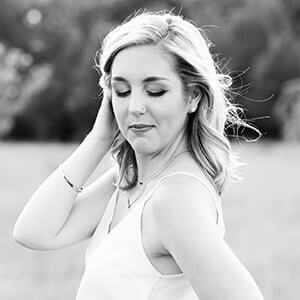 It’s kind of a “fad” in the health and beauty community recently – but I think for a good reason! Let me tell you how it works. Simply take about a tablespoon of coconut oil and put it in your mouth. It will have a slightly “coconut-y” flavor and obviously be oily, but I don’t think it’s bad at all! Then, just swish it around in your mouth (just like you would mouthwash.) The longer you do this, the better – ideally 20 – 30 minutes. I know that sounds like a lot, but if you distract yourself by doing something else while you’re swishin’ away, it will go by much faster! Why swish around coconut oil in your mouth for a half hour? Well, this method has been proven to decrease bacteria in the mouth, whiten your teeth, and even improve gut health! On top of that, your mouth will feel so squeaky clean after doing this. Wanting to read more facts & fictions about coconut oil? Check out this helpful article! Coconut oil is soooo hydrating for your skin; give your skin the deep breath of moisture it needs! My favorite way to moisturize my skin with coconut oil is actually in the shower. I lather excess amounts of oil all over my body – especially my arms and legs. I let it soak for a few minutes and then lightly rinse it off before getting out. Pat your skin dry and you will be amazed and the buttery softness of your skin! If you want an extra dose of hydration, apply some more coconut oil to your skin after you get out of the shower and are dried off. Just be careful to not apply too much, so you’re not left with an oily residue (especially if doing this in the morning when you have places to go.) 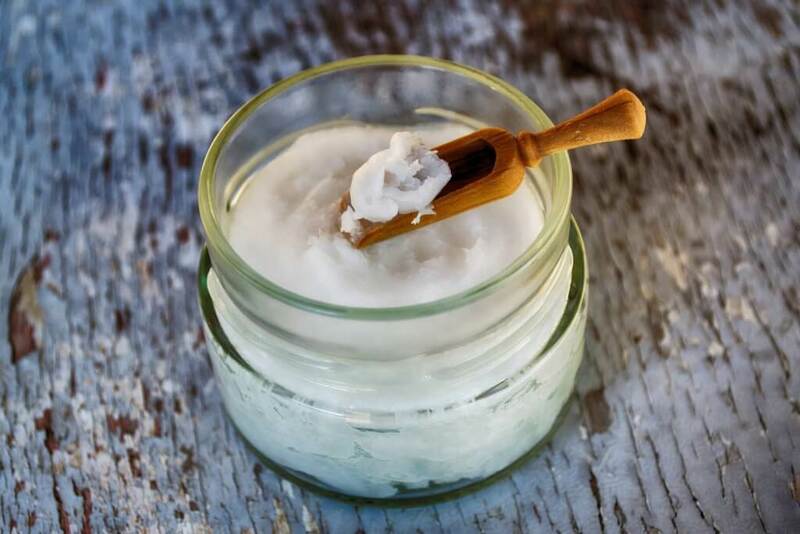 When applying coconut oil dry, I use a small teaspoon – sized amount to my legs and arms. This leaves them soft and glowy! I don’t know about all of you – but I think I might have the world’s driest hair. This can definitely be a blessing and a curse! Yes, I can go multiple days between washes (usually 4-5!) without any oily roots, but my hair is extremely broken and brittle. That’s why coconut oil hair masks are such a must for me. Simply apply a generous amount all throughout your hair – from root to tip. Don’t be afraid to use a lot! Then, tie your hair up in a bun, so it doesn’t get everywhere. Let the oil soak into your hair for 20 – 30 minutes (the longer the better.) Jump into the shower and rinse/shampoo well! I usually shampoo twice after using coconut oil, just to be sure there’s no residue left over. Once your hair is dry, you should have noticeably softer and shinier locks! Another great way to moisturize your skin with coconut oil! 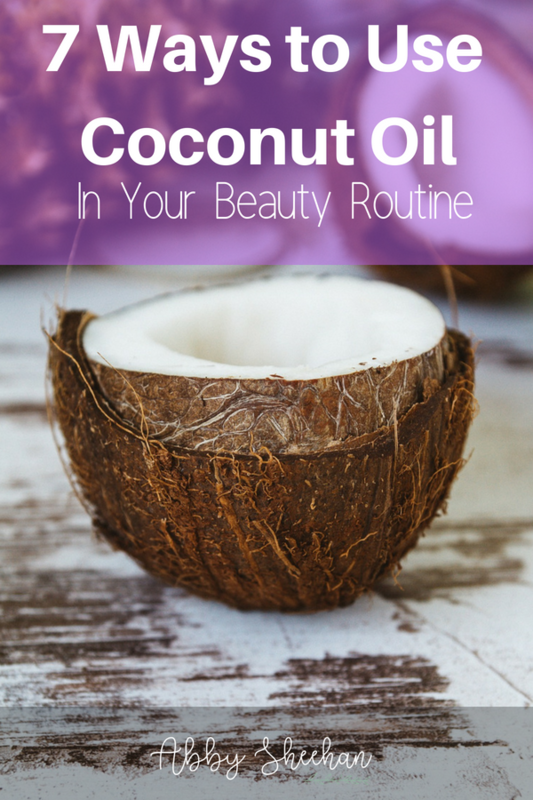 If you are going to apply coconut oil to your face, it’s best to do it at nighttime and not use too much. Applying at night gives the oil all night to really sink into your skin. And if you use too much, it can actually have a reverse effect and clog your pores. I would recommend doing this around once a week. To get the desired effect, simply apply a generous (teaspoon-ish sized) amount of oil all over your face. Then, simply lay on your back and let it sink in! Coconut oil is great for the fragile skin underneath your eyes as well, so ensure to massage some in that area as well! Say buh-bye to bags and dark circles. Coconut oil is my go-to makeup remover whenever I run out of wipes (which is, like, all the time…I go through makeup wipes like a mad woman.) However, whenever I’m forced to use coconut oil to take off all the makeup, I’m reminded of how easy and convenient it is, and it leaves my skin so soft! The way I do it is to just use a clean rag and dip it into the coconut oil. I then gently massage it all over my face (extra gentle around the eyes.) Now that I look like a melting raccoon, I simply cleanse my face like normal and it all comes off so easily! Pat dry and continue your skin care routine as normal. I’m always thankful for this tip when I am in a bind or just need an extra boost of moisture! Another super simple hack if you need it! Applying coconut oil directly to the lips helps with any chapped lip problems and is super moisturizing and refreshing. Whenever I can remember, I apply this to my lips (again…pretty generously) right before I go to bed. This allows time for everything to soak in and get beautiful. Combine this with tip #4 and you’ll wake up a glowing, moisturized goddess! Ugh, does anyone else have the absolute worst cuticles of all time? I am always suffering from hangnails, cracked nails and dry cuticles (even in the summer months.) Coconut oil seriously works wonders for this. Just like all the other tips, apply coconut oil directly to your cuticles and massage in. Again, doing this before bed is easy and then gives it plenty of time to sink in! If doing this in the daytime, just use a lot less oil and you’ll be good! 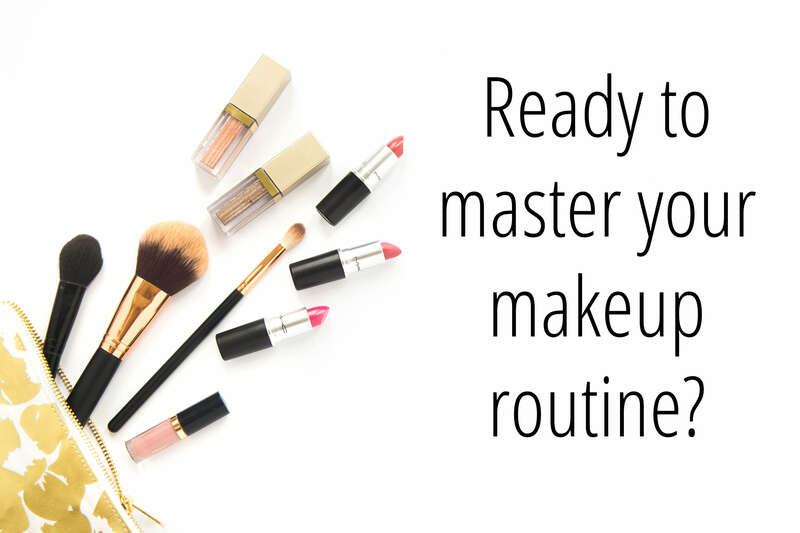 Have you tried any of these tips? How did they work for you? Do you have any other uses for this miracle of nature? Let me know!